Is Amazon really going to update the Kindle so soon? We brought you the breaking news of it live from E3 yesterday and today we get word of a release date for Nintendo's new Wiimote add-on that's supposed to make life with the Wii so much better. Apparently, the MotionPlus dongle will go on sale in spring, in the US at least, for $50 (£25) as a bundle with a new sports package called Wii Sports Resort. The UK release will, inevitably, be around the same time, although you can probably add a few extra pounds onto that price. Speaking of which, aren't all these add-ons making the Wii something of a money pit, rather than the super-cheap console it's supposed to be? Next, we return to the kerfuffle Tom's Hardware caused when they published a group-test comparing solid-state drives with ordinary hard drives. If you recall, the TH guys found that SSDs actually shortened battery-life, only for the industry to rally round and point out that the testing had been flawed and that it wasn't run by hucksters after all. Now, like any self-respecting publication would, Tom's has issued an apology and re-done the tests as they should have been in the first place. The results show that some SSDs are better for the battery than HDDs, but that there are still claims about SSDs being made that simply don't stand up. In other words, Tom's Hardware ate plenty of humble pie, but not all of it. Lastly for this morning, anyone hankering after an Amazon Kindle e-book might want to hang on to see if rumours of two new versions coming soon are true. 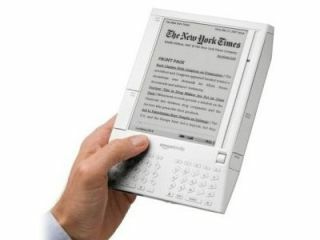 While a much larger, 11-inch-tall version seems unlikely, we can see a smaller Kindle in a range of colours being a hit. Of course, the hefty price tag will need to be slashed too, but we have seen a bit of that happen recently, after all.